The Ideal Balance gift box that we won contained a bag of dry cat food, in addition to the cans of moist and the treats. The treats were refused with a look of pure disdain. The canned cat food has been well received by Pilchard and not so well by Mija. I'm not sure Mija will ever appreciate canned food. They don't get it very often so I can live with Pilchard eating her serving and Mija's after Mija licks some of the juice and then walks away. 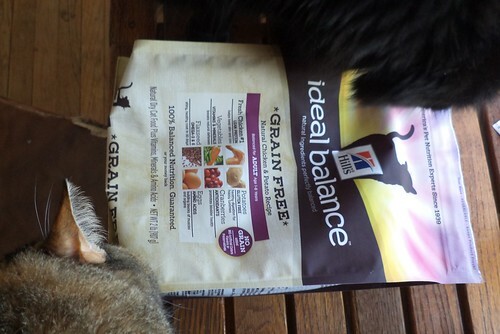 I finally tried the Ideal Balance dry cat food. Previously, they ate Merrick's chicken flavor. They liked it and I noticed they weren't inhaling the food as quickly as with the Purina Naturals. I think the lack of "empty" calories in the Merrick, which come from grain, meant they were full sooner and that lasted longer. The loss of weight for both of them at the January vet visit was proof that I was doing something right. But I wanted to see if this new brand would be liked as much as the Merrick. I put out a bowl of Merrick and a bowl of Ideal Balance. The Ideal was gone much sooner than the Merrick. As I needed to get cat food, I decided I'd get a full size bag of this since they seemed to really like it and it met my criteria for food to feed them. I was not prepared for the sticker shock. A smaller bag of this compared to the last bag I bought of Merrick, cost $14 more. All of these bags have a velcro top with which to reseal the bag and keep the food fresher. That's not worth $14 more. I don't see any difference, really, between the two kinds of food other than price. That $14 is a big bag of Purina plus a big bag of Merrick. That's a huge price differential for me. I could not get the advertised special because I haven't saved up enough Petco points. As the only reason I go to Petco is because the closer pet food store didn't have Merrick, I won't be accumulating enough Petco points to get the sale price. The Merrick was on sale without Petco points. So, once this bag is nearly finished, we are going back to Merrick. I think I will look online for deals too. There are a number of places from which I can get Merrick delivered to my door. I don't even have to set foot in Petco. I love my girls and want them to have the best nutrition but it also shouldn't be a bank buster for me. We tried the merrick but I don't think it's a good fit for our two after a couple months of mixing it in with the Natural Choice they usually get we find that there is always merrick at the bottom of the bowl at the end of the day. I think they prefer the Natural Choice and Clark has had some digestion issues with the merrick that he wasn't having with the other. So we're in the process of switching them back.